It was eye opening to hear Josh Harris, interviewed during the game last night, talking about the trade for Butler. He specifically phrased it as "getting the 3rd star" for the team as if Fultz did not even exist. If they are going to bury him, destroy his trade value like they did with Noel/Okafor and then dump him later for no return, they should be ashamed of themselves. They'll likely blame BC for everything since it is convenient, but it still would be a huge mark on the entire organization. On the other hand, I like what Muscala is bringing to the team - rebounding, good foul shooting and some touch from outside. Nice to see. You really can't let go of noel and okafor...they were bad picks...they were not killed by coaching. I think the issue with Fultz in part is his pride...IIRC he didn’t want to play in the summer league this past summer because at least in part it was embarrassing as a first overall - other first overall guys haven’t had to do it. I would expect he’d similarly reject the D League - first overall guy haveing to admit he needs the D league isn’t something that is generally needed and thus an embarrassment. Not agreeing with that, because he should go to the D league for exactly the reasons you name, but I’d be shocked if he did. Noel and Okafor weren't good picks. Fultz, however, is a disaster. I think Fultz is what happens when the player a team pretend he isn't injured and in need of shoulder surgery. I can't tell if he is injured and needs surgery or is a head case and needs a sports psychologist. Either way, he needs to not be taking up a roster spot right now. Sesame seeds or oil may cause Zhaire Smith to miss the whole season. The process must have been built on an indigenous peoples burial ground or something. The amount of bizarre and lengthy injuries to first round picks is bewildering. Since the other team I follow is the Blazers this all seems normal to me. 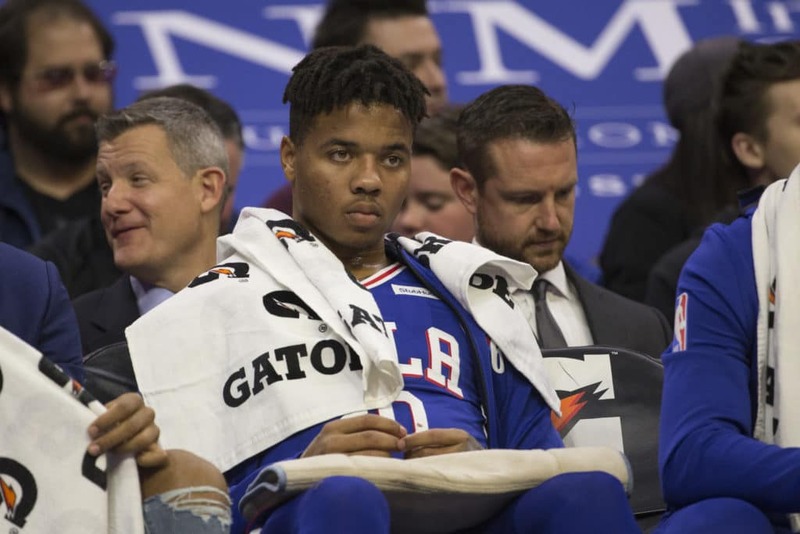 In addition to a previously diagnosed shoulder injury, Fultz has been playing with an apparent injury in his right wrist. He'd also like a fresh start elsewhere, according to sources. "Sources with knowledge of Fultz’s thinking have also told The Athletic that the player would prefer a fresh start with a new team." I'm not sure I trust "Sources with knowledge of Fultz's thinking". Way to vague, way to open to subjective interpretation. But that's been the subtext all along these past 24 hours no? They took him out of the starting line-up and then all of a sudden, boom, new (or previously unrevealed injury) and agent ("lawyer") is suddenly making headlines. The agent is likely the source. And those are good reporters (including our own sometimes listmember) on that story. Messed-up as the Sixers have been (under Colangelo, with no GM and maybe now) I'm not sure this one is on them though. I'm not sure what Fultz's agent expects to accomplish. The Sixers aren't about to let him go for cheap and another team isn't about to offer value until Fultz demonstrates he is healthy and actually has value. As of now, he hasn't, and the 'I'm hurt' only reduces his value. If you read the story the other source could be his mother (or his previous shooting coach). It's just not a good situation for either side really. Fultz and his agent both denied he's looking to be traded. Great win against the Pelicans, It would be nice if for once they could hold on to a 15/16 point lead and close a game out a little easier. Yes, this one is on us. Fultz worked out with the Celtics and they spotted the problem and decided to trade down. Fultz worked out for Colangelo and company and they saw no problem. There was a problem. Reading between the lines, it seems that Fultz knew his 3-pointer wasn't an NBA 3-pointer, worked with his mother's friend to build up enough strength to lengthen the shot to NBA range, and hurt his shoulder by over-doing it. When he tried out with us, he either lacked a long-enough shot to be an NBA 3-pointer or had a shoulder injury. Likely the minor surgery he had wasn't enough to correct the shoulder and either by nerve damage or over-using other muscles to compensate for the shoulder injury, he now also has a problem with his hand. Repetitive stress injury in computer workers is often carpal tunnel, but also can be shoulder or elbow, which affects the nerves in the hand. It can also be caused by thoracic outlet syndrome, which can be a big problem for pitchers as well as office workers. Most likely, it is a combination of bad talent evaluation, poor draft trade, misguided roster construction and a failure to develop Fultz's talent so far. Fultz or BC will likely get most of the blame, but everyone else that was involved should not escape without accountability. As far as we know, the owners signed off on it, Brown approved it and the other folks like Cohen helping the GM approved it. They may start to distance themselves from this decision if things continue to go south, but I doubt any of them were that opposed. Fultz was widely accepted as a top pick (maybe not THE top pick) and certainly had shown in college the range of skills to play at the NBA level. People moan when Okafor and Noel come up again, but this is a historical pattern in this 76ers era. If Fultz was the first situation like this, one could shrug it off as an outlier, but he is not unfortunately.